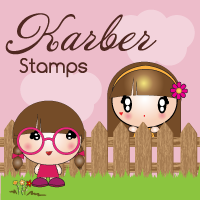 Today on Lollipop Crafts, our sponsor spotlight this week is Karber Stamps! They have some adorable stamps and digis, and the awesome prize for this week's winner is 2 digis of their choice! "KARBER is a company created by Karla Barradas and Berenice Rendon. All began for passion to art and crafts, as friends we decided to join our different talents. In July 2010 that journey would lead us from hobby to a business and “Karber Digital Images” was created. Recently, Karber Digital Images expanded to offer it's customers rubber stamps available through Sparkle Creations Store and therefore, have changed their name simply to Karber Stamps. Visit Karber Stamps store and blog. The papers are from Recollections holiday pad, MS punch and Recollection punch﻿ for the snowflakes, ribbon is from Michaels. Colored this cuite in Copics, added some stickles, and followed a sketch from Papertake Weekly. Stop by the LC blog to see more creative inspiration from the girls, and deets to play along this week's challenge. This is super cute Mimi!! I love how you added the sparkle to the edge of the beanies. Both images are adorable! Love the colors you chose. Sweet Christmas card! awww.... this is super duper cute, Mimi! love your coloring on the image and the design is fab. super card. LOVE it! Cute! I love those cute little characters. I really like the way you used the glitter glue. :) Thanks for playing at SPCC this week! Super cute Mimi! Love the fun colors! Btw, thanks for my swap! Love it! You did a beautiful card! love the image.